I’ve just been alerted (Thanks, Jane) to The Body in the Library, an online exhibition by Monash University, displaying a terrific array of covers of detective stories of all types. 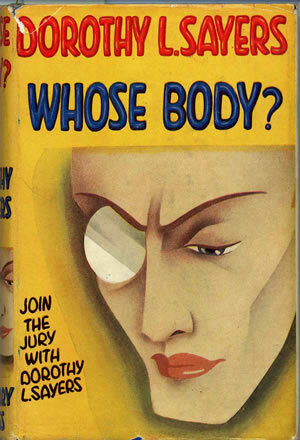 Pictured is Dorothy Sayers’ first Peter Wimsey novel, Whose Body? This is a book that I’ve sometimes cited as typical of twenties fiction – it’s jollying along nicely within its genre, and then suddenly memories of the War disrupt and disturb it. This entry was written by George Simmers and posted on March 16, 2012 at 7:23 am and filed under novels, popular culture. Bookmark the permalink. Follow any comments here with the RSS feed for this post. Post a comment or leave a trackback: Trackback URL. Let me draw your attention to the current part-work issues of Agatha Christie novels in facsimile jackets which are appearing fortnightly at newsagents. It’s the only time I can recall where a publisher has taken the trouble to re-issue books in their original form – so much better than the generally characterless modern issues. I may have to put ‘Whose Body’ on the web-site. So far I’ve only included ‘Bellona Club’ which is rather soaked in the War, the body, as I recall, being moved during the silence. Have you come across item 63 before, George? (the one where the detective is a demobilized WW1 soldier). No, but I’ve found a cheapish copy on the Internet, and have ordered it. Just blogged on John Street, another notable Great War veteran turned Golden Age detective novelist. My book on him (and two other writers) comes out this June. WW1 was not as central to his work as it was to that of Henry Wade, but it does crop up. Street and Wade wrote about these matters from first-hand experience!